Note: This line showed initial mortality likely caused by fragmentation stress during the planting process, but since its first monitoring stage it has not had any mortality. Growth rate is increasing with age. To begin with, skeletal extension was quite slow, but between 6 months and 9 months and on to 12 months, we have seen an increase, with fragments extending at a faster rate than before. Moving away from science, the fragments are incredibly beautiful up close- they have bright yellow polyps! The line is now almost 3 years old, and mirculously survived the El Nino bleaching event! 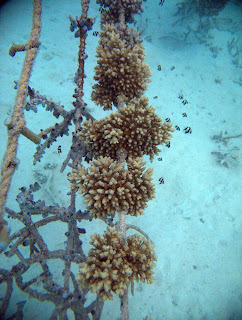 It is one of our best lines and we intend to transplant it to the reef in the coming weeks!